Original pieces for fingerstyle/classical guitar accompainied by synth/ keyboard. 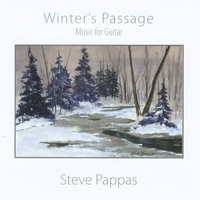 With revolving melodies emerging from Steve's guitar, accompainied by swirling synthesizer orchestrations, Winter's Passage gently embraces the listener. The music is as comfortable as a rocking chair in front of a fireplace on a cold night. This entire cd is fantastic. I'm an elementary teacher and I've been playing Winter's Passage every day in my classroom. It's soothing, calming and serves a gentle background even while I'm teaching. Each selection seems to evoke an emotion and some of my students have even started to choose their favorite track.